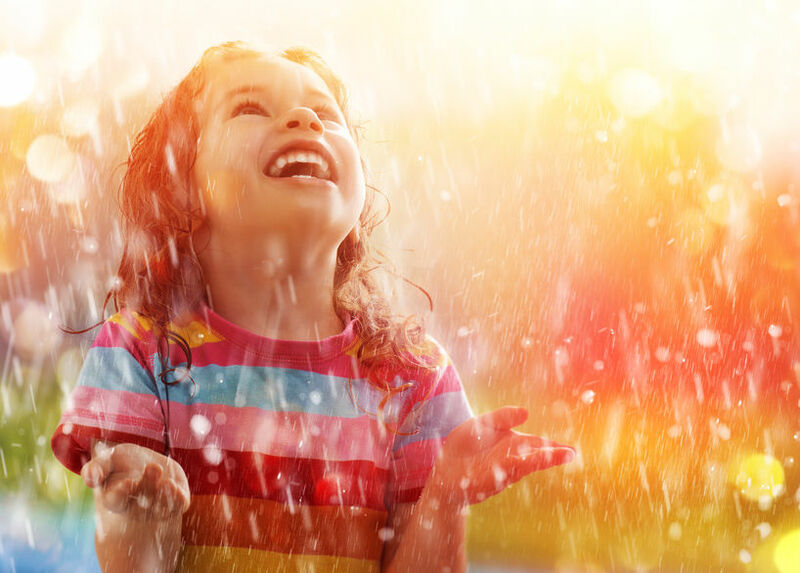 Happy child playing in the rain. I have to be honest. I’ve never been very clear about the concept of grace. Growing up I heard about grace in church sermons, focusing on whether grace is enough for salvation or do we also need to do good works. I never really gave much thought to how the power of grace applied to my everyday life. Fast forward to a recent conversation with a good friend about letting our light and love defeat the darkness and negativity all around us. As we concluded our time together, she left me with a powerful thought – let’s try to be kind and show grace. This has stayed with me and I’ve been contemplating the use of the word grace in a broad, non-secular context. After reviewing several dictionaries, articles, and blog posts, I have come to this understanding of the concept of grace when used in a metaphysical sense separate from any religious meaning. Grace is accepting we don’t have to earn our way to a blessed and rewarding life. We can relax into knowing the gifts and lessons that are meant for us will find us. We can watch what others are experiencing and receiving with a sense of true happiness for them, because we know there are enough resources and lessons for all of us. This idea of grace resonates deeply with me. Being able to trust and relax in the life that is unfolding and be present for one another is truly the meaning of a life. I cannot help but ask the next question – how can we experience more of this kind of grace in our lives? Here are a few initial thoughts. Our hearts are longing for people to see us, to hear us, and to share a smile. When we slow down and offer this to people throughout the day, not only do they experience that moment of grace, but we amplify our own state of grace. George Clooney recently received the AFI Lifetime Achievement Award. When his friend and colleague Anna Kendrick was asked what makes him so special, she replied that he always makes sure other people are comfortable and works to lift them up. For a man who could certainly treat himself as too important for other people, he seems to fully understand how to be kind and show grace. When I am confronted by what feels like judgment, rage, or meanness, my instinct is to speak up and push back. I really hate bullies, and I have a strong avenger streak in me. However, I’ve learned over the years to recognize when the avenger is triggered and pause before I take action. Allowing the first wave of my own anger to wash through me allows me to see the situation more clearly. Often I see the bully is really a scared kid inside. I can choose to pity the bully instead of engaging. At least I have a chance to assess if it is worth losing my inner peace over it. Maintaining grudges can be a serious impediment to showing grace. Even though we may say we forgive someone, if we still think about the offense, bring it up, and feel wronged by it, there can be no real grace with that person. I recall a friend who used to talk about the Revenge List he kept so that if he ever got a fatal diagnosis, he would know who to confront and with whom to settle the score. It may have been a partial joke, but I know he carried around a lot of hate and anger. The problem is that keeping a long anger ledger is like drinking poison and hoping the other person dies. We need to work on actually releasing the anger, hurt, and pain. Until we do, it stays with us and blocks the flow of grace. I find a hike into the desert can be very therapeutic in this regard. I like to scream, rant, and cry when I am totally alone with Mother Earth. I find the physical act of walking and then releasing my emotions through my voice is a very effective release. Let’s make a special effort to remember our natural state of grace – we are being guided along our life path, there is enough for everyone, and we flourish when we reach out to one another. Thank you so much for this thought provoking article. I definitely needed this at this time in my life. Hope all is well with you and your dear wife. Sending love! "I want so much to express my deepest love and gratitude for teaching me in such a beautiful way those principles of truth that literally changed my life overnight. I have never been happier. The things I learned from you have set me free because I have learned to love myself and to be completely open and honest. It's amazing that I have lived my whole life for others approval but I’m so excited to have the rest of my life to do it my way."